Yesterday, after a rather damp day, a good dry breeze picked up. So I called Kev and half an hour later we were walking in to Wave Buttress. I had my pick of either trying to repeat his E7 Cu Sith, or trying a new one that I’d cleaned last time I was there. With the breeze strongest on the new route, I chose that and finished cleaning it. I’d forgotten to bring a top with me and I actually got rather chilled as I cleaned the route in a good strong wind. Once I lowered down for a think about leading it, I started a comedy wobbly shivering fit. Right then, two of the world’s best trad mixed climbers, Guy Robertson and Greg Boswell came past. I tried not to look freezing cold on a June evening. The route started up a gnarly old E5 called Frantic Across the Atlantic, put up in 1987 by Mark McGowan. Mark is a pretty bold trad climber and even with the in-situ nut and peg (long since fallen out), the route is a full value old school E5. Near the top of the big slab it runs into a vertical arrier headwall and escapes left into the famous Crackattack (E3), leaving the obvious finish direct through the headwall unclimbed. I could see why. Where the peg was, there is now a collection of appauling gear I probably wouldn’t even lower off on, followed by a very thin, teetery move right that would be very easy to fall from. I wouldn’t like to think what would happen. I knew I could do it if I was feeling confident. So my strategy was just to climb up the E5 part and see if everything was good inside my mind on arrival at the headwall and make a decision from there. At the last gear, I sort of laughed to myself. I didn’t feel any less apprehensive about committing to the crux. So the usual process took over - I just don’t like passing the opportunity to get the climb climbed. So without saying anything, I just swallowed hard and did it. What else can you do? Kev came round to my place so I could help him capture the footage from his tape of his recent new E7 at Wave Buttress, Cù Sìth (pronounced Ku Shee, it’s Gaelic). I ended up cutting it into a wee clip which you can see below. Well done to Dot for filming with one hand and taking pictures with the other! As you can see from the film, the climb has a lot of personal meaning for Kev. You can’t help but feel cheered by his obvious genuine ecstasy on topping out. It’s quite a big moment to realise you can still make good things happen after so much trouble with injury, and several years regaining fitness and confidence. Apart from that, simply completing a hard and dangerous route you’ve put a lot of work into is a fantastic and highly addictive feeling. If you’ve never tried projecting something really hard, this is a great advert for it. It has to be properly hard though - if you know it will go, eventually, it probably isn’t hard enough to take you on a real adventure of doubt. 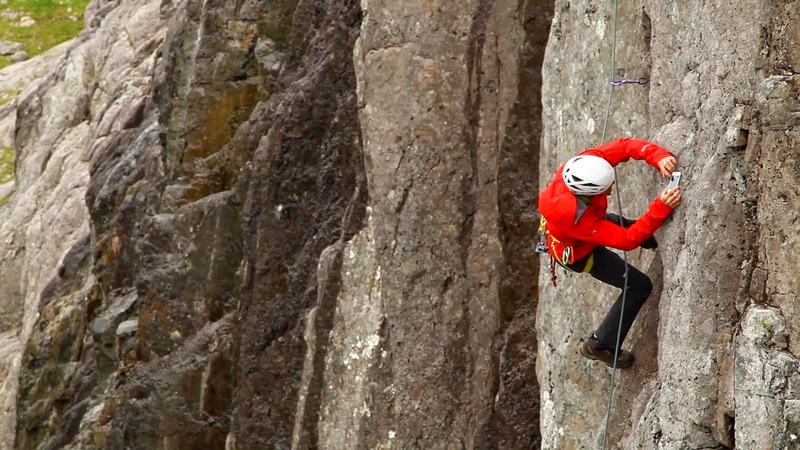 This film is about a guy with one hand and a fused ankle taking on an E7 first ascent. What would you have to take on to give an equivalent challenge? That would be quite something! 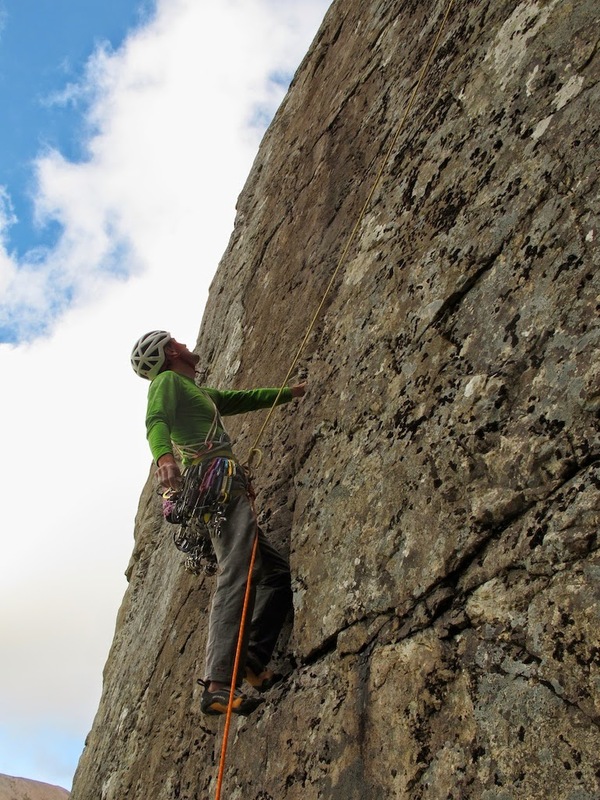 Last autumn I extended Blair’s traverse of the Ruthven boulder, making a mega 40 metre F8b. But the challenge remained not to go up at the crux to the good line of holds, but to take on the full challenge of the tiny crimps and slopers below. I tried it for a few sessions last October, and two days before my ankle surgery, I got reasonably close to it. It was looking like an F8c or Font 8a+ standard piece of climbing. 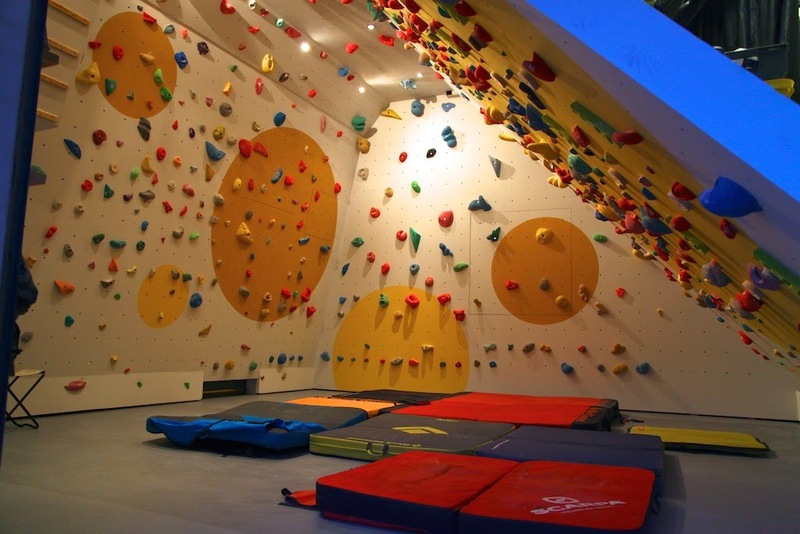 I intended to go back this spring, but I built a climbing wall instead. So I just got round to it last weekend with Alicia, reworking the sequence and having a quick burn. I didn’t quite have the flow required to stay nice and fresh for the crux after 30m of F8b climbing. But after another focused visit of getting it wired and having good training burns, the other night I managed to do it. 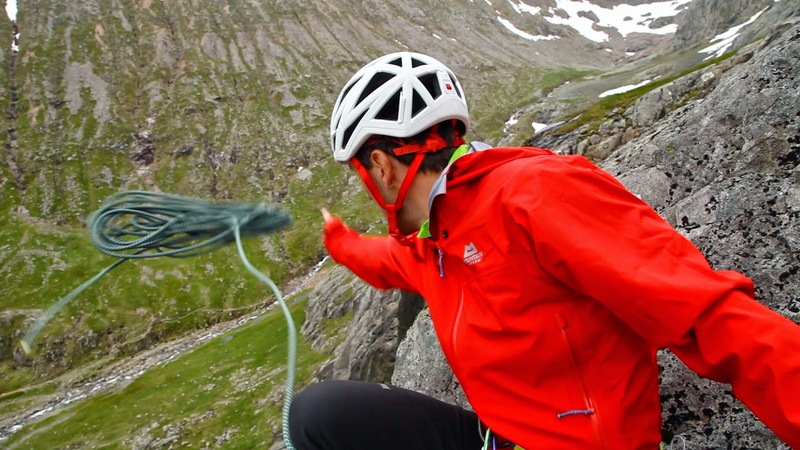 You can see the video below - It’s a great trip with an intense crux after a lot of climbing. It was a little bittersweet leaving the boulder after the successful redpoint, knowing I have no projects here to come back for. I have done all of the problems here now and really enjoyed the location for it’s tranquility. Even the drive through the hills east of Loch Ness is very relaxing, especially on a Sunday listening to Crunluath on the radio after lunch at the caf. It’s also a handy place to dodge the Lochaber monsoon, and the midges. Thankfully, the world is full of rocks to climb on. Pastures new! Leading pitch 3 of The Wicked, E6 5b, 6b, 6b, 6b, 6b, Ben Nevis. Photo: Dave Cuthbertson/Cubby Images. 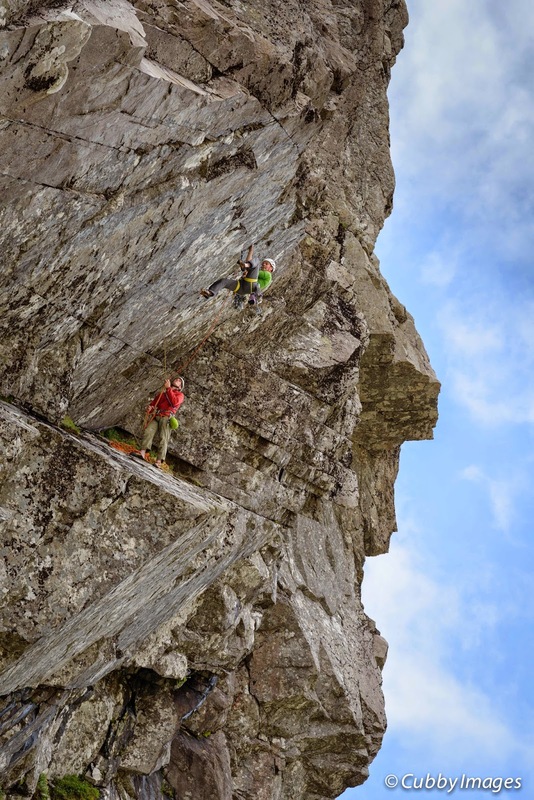 In 2000 and 2001, Gary Latter and Rick Campbell worked on a major new line on Carn Dearg Buttress of Ben Nevis. 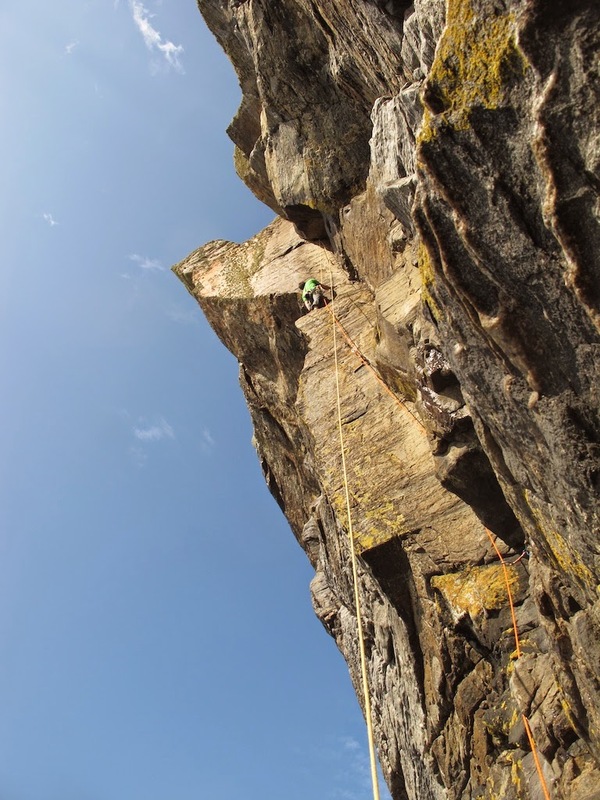 It took the obvious challenge of stepped grossly overhanging wall pitches, followed by the attractive wall left of the Bat corner pitch high on the buttress. 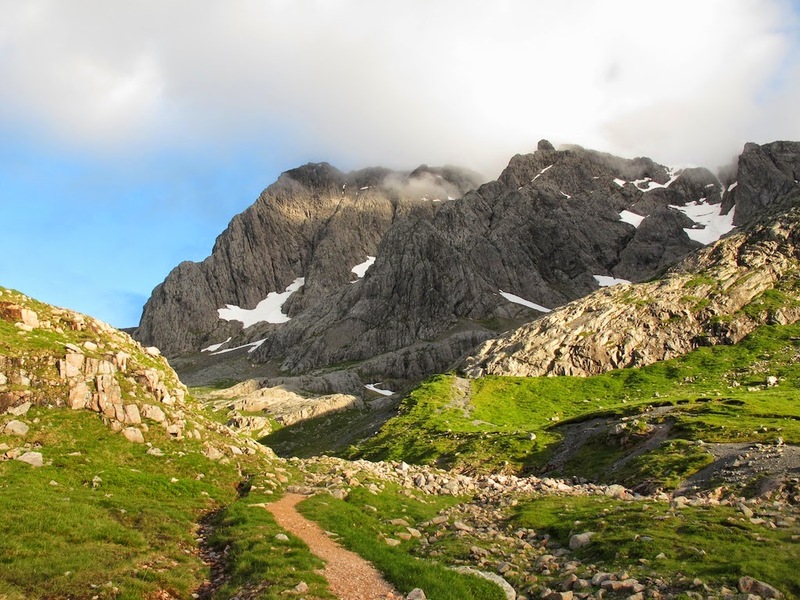 At the time it was by far the hardest rock climb on Ben Nevis, before much harder routes such as Anubis and then Echo Wall were put up in the years following. They approached the climb ground up, cleaning the route on aid and then redpointing the pitches. 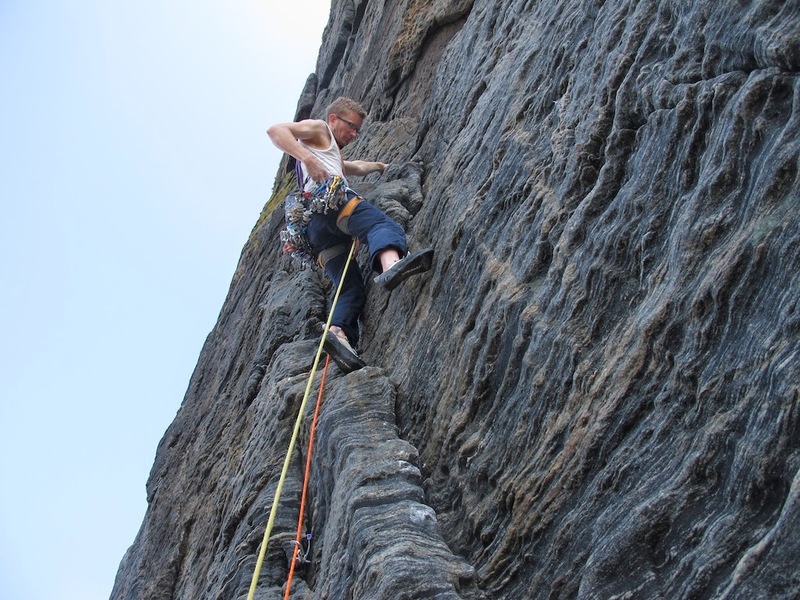 However, they did not climb it in a single push, but rather climbed various pitches on different days (and years) by accessing them from the easier routes, eventually grading the route E6 and calling it The Wicked. This left the obvious challenge of a first continuous ascent. 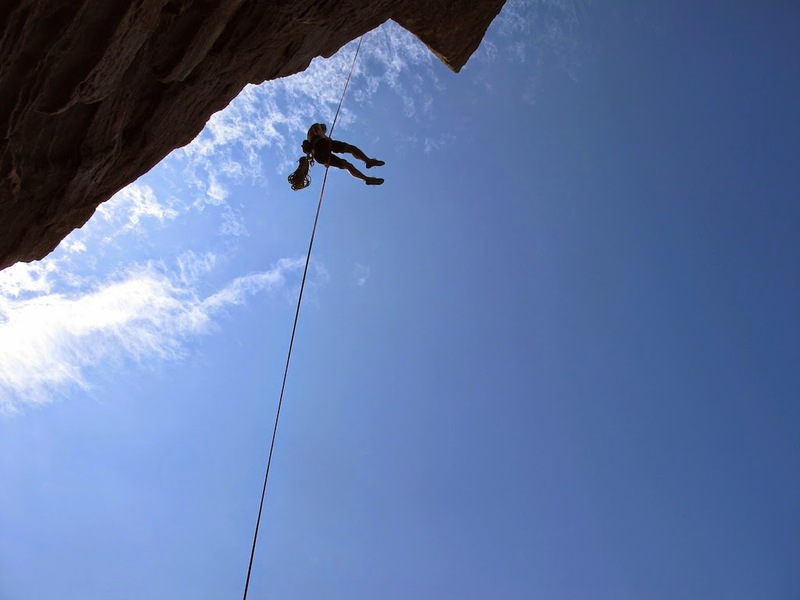 It was a great challenge too, as the climb has four consecutive hard pitches. I had stood at the foot of it once before with Niall McNair several years ago, but it was wet. In fact, frequent wetness on the first two pitches seems to have helped maintain its unrepeated status for all this time. As far as I know noone else has climbed it. I went up to the buttress with Donald King the other day with no particular plan. Since a period of fine weather had not long started, I expected to find The Wicked wet and we might go for the other mega E6 on the buttress, Trajan’s Column. But on arrival, the wet streaks didn’t look too bad, so we decided to go up for a look. 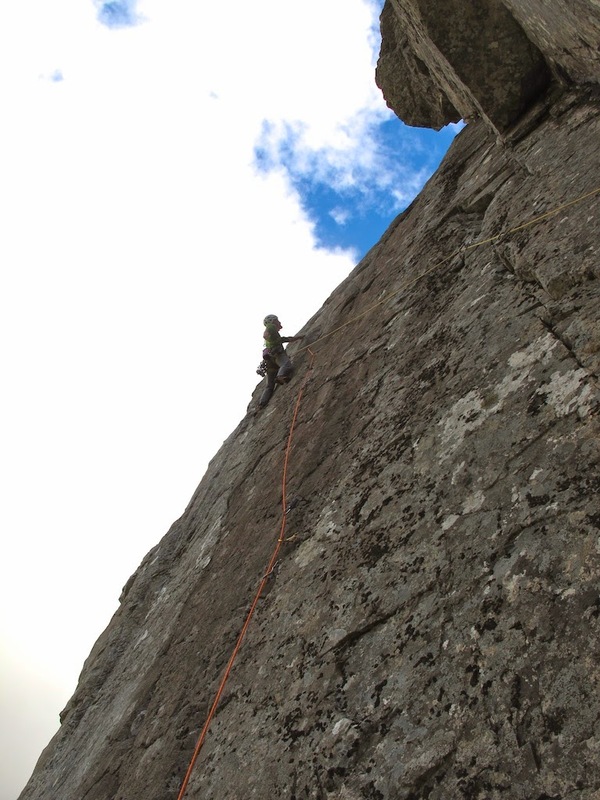 Donald studiously avoided a few wet holds on the first pitch which was ok. But on closer acquaintance, the slab leading up to the first hard pitch looked pretty wet, and the start of the crux itself even worse. I went up, expecting to quickly come back. At the overhangs, the holds above looked quite big so I wondered if I could just climb on through the wetness. I knew it would end up in a scrap, but who cares? It’s training. And, who likes starting up a route and not finishing it, ready excuses or not? I picked my way through the wet and sharp jugs in the roof and eventually managed to grab a flat jug over the lip. Looking down, there were no dry options for feet whatsoever. Hanging with my feet off, I felt under pressure to make a decision so opted for an overhead toe-hook behind a loose looking flake. This worked nicely to get a runner in and dry wet hands. But with one hand in my chalk bag, the block suddenly flew out, sending me swinging wildly with one point of contact. Instinct kept me on and there was no option but to go up, quickly. Below, Donald tried hard not to laugh. The holds beyond were manky, covered in thick lichen and the odd bit of wet moss. I pressed on trying to clean as I went, but totally pumped, I slid off onto the rope at the last move. Eyeing up the final pitch of the lovely wall left of the Bat corner. Why on earth didn’t I put the brush in my bag? A quick clean by rubbing the slopers with my hands sort of worked, and on the next attempt the pitch went down no problem. The next pitch was almost as bad, cleaning thick lichen off most of the holds while pumped, but at least I got up it onsight. The next was even worse and I slid out of licheny jams twice before giving it a good rub with my T-shirt and getting it done next go. The final 6b pitch up the lovely Bat corner wall looked immense. It looked a little less dirty too and I was determined to clean it on lead without resting on the rope. However, as I reached for the crucial crux crimp, my finger tips sank into a fluffy pile of moss which was saturated with water. Damn! Even that one needed a quick garden before releading it from the start. All in all we got quite a workout. But we got to the top! On October 19th I am at the International Mountain Summit in Bressasone/Brixen in the Dolomites. Gore-Tex are running a competition as part of their long running experience tour for myself and David Lama to take some of you guys climbing for the day on Oct 19th. Gore-Tex are paying the expenses to get to the Dolomites too! I mentioned before I’d been doing some filming in front of camera. I was on the sea cliffs of Lewis and some footage of me throwing myself off Screaming Geo is now in a Land Rover ad which reached the TV screens of the UK last night. You can see it above. I was aware I needed a bit of falling practice after the last proper trad fall I had ended in surgery. There is a short film about one of the other guys in the ad called Mike Goody (the blade runner) below, which is a really nice and honest film. Worth watching. It’s amazing how feeling a bit powerless can really creep in and affect you after an accident or injury. I must admit I’ve let that happen quite a lot at times over the past year and been in need of a bit of support (understatement) from friends to help me get through. It’s not as black and white as just finding the will to be positive, as some sources of advice would suggest. You have to have something to be positive about. I.e. there has to be a plan, and knowing what that should be can be next to impossible when you are very injured. I reckon most folk can deal with adversity pretty well, and many can even take it in their stride. It’s the uncertainty that really hauls you over the coals. You aren’t sure if you are still going to be able to be the person you are and want to be any more. Even the old Churchill saying about 'when you're going through hell, keep going' is a bit simplistic. Sometimes you just don't know where to go to leave your present predicament. I've definitely learned over the past year or two that good help and advice are critical. Without it you are vulnerable. Good friends and very very good doctors who share, or at the very least, truly understand your goals, are precious. In the ad, everyone was saying 'I can'. It's true that 'I can' is the message it boils down to. But the wider story is 'with your help, I can'. The MacLeod wall. Done. Let's get climbing! 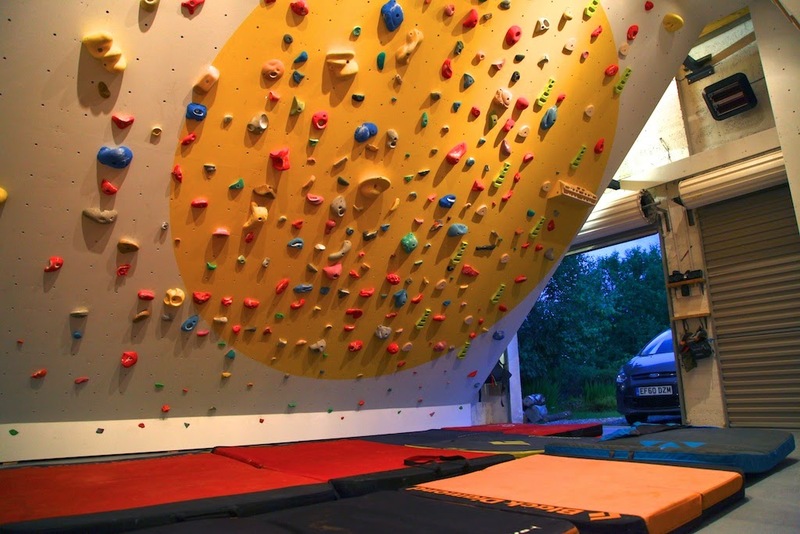 The past few weeks have been varied; film work in front of camera, behind camera, voiceovers in studios, training for summer in the alps, researching for my injuries book and finishing getting all the holds on my wall. It sounds a bit stupid, but I underestimated how long it would take to actually get all my holds on the wall. And I was grateful to be gifted lots more from friends. Being the slightly maladjusted character I am, I was anxious to finish the project completely before starting to climb on it. I just didn’t want to be climbing on it when it still felt like a building project. So it was really nice to get it all perfect and then start to climb. The only pieces of the puzzle left are the mats which are being made right now. It feels just great to be training. It’s just over a year since I dismantled my wall in my old house, and it’s only after starting to climb on the new one that I’ve truly realised how much I’ve missed it. Between days of setting, training, and book work, we have been making a film for a Glasgow based Geology company called Midland Valley. They make software for structural analysis of geology and have produced a smartphone app for digital mapping in the field. We had a nice couple of days running around the north face of the Ben shooting with them and me abbing down cliffs and getting my phone out instead of doing what I normally do! Freida like to tire me out at the swings. The past couple of weeks have been filled with a couple of exciting film jobs, one involving taking some air time. More on that later. 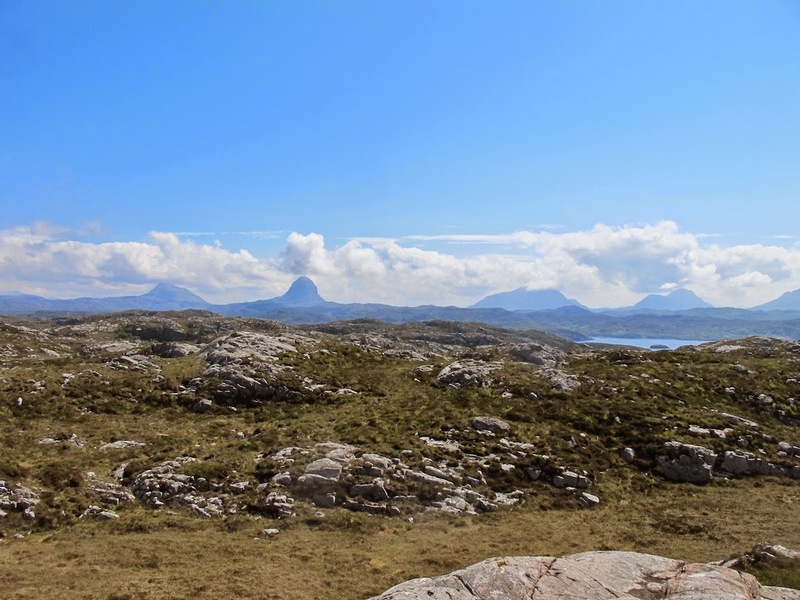 I had a weekend booked in with Steve to head to a good sounding Gneiss crag near Lochinver in the north west called Creag Rodha Mor, or more commonly known as the supercrag. It’s the sort of terrain you’d normally have to travel to the islands for; big steep pitches on positive holds and generally good gear. 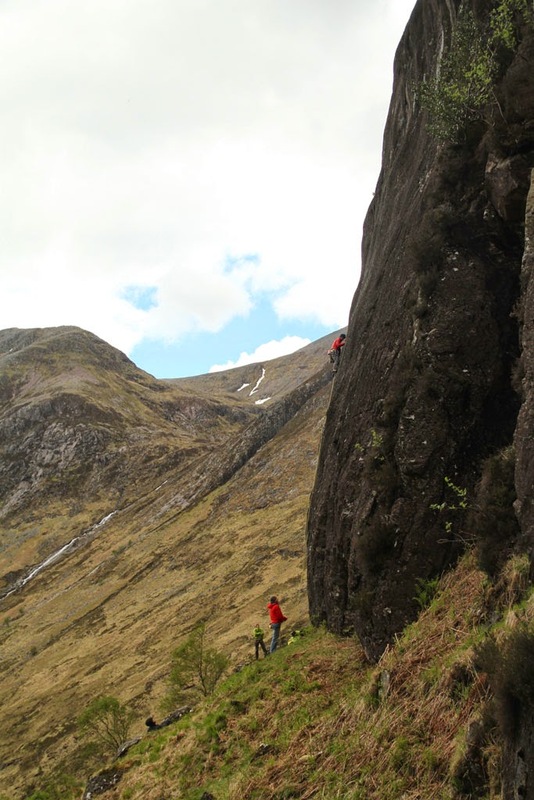 On our first day we sped up from Roy Bridge, abbed in by 2pm and got cracking on ‘My own personal Mingulay’ (E4 5c, 5c). The morning dampness was still hanging about the crag a little, but with such huge holds and sinker gear, it didn’t matter. Steve was going well despite little opportunity to get out climbing for some time. I wouldn’t say I was going well, but at least I was going up. 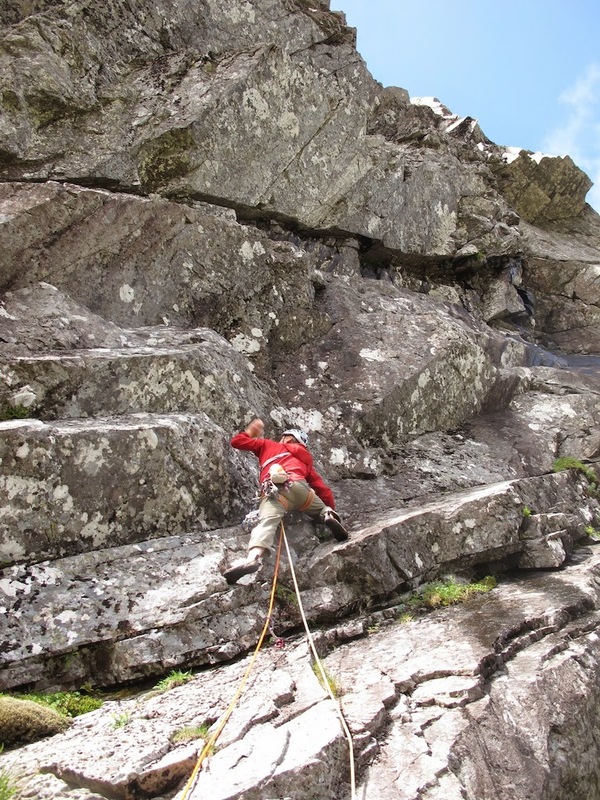 Steve on pitch 2 of My Own Personal Mingulay (E4 5c). Once the blazing sun hit the wall, it went from damp to roasting and greasy, so I bumbled up Ruddy Glow Corner (E4 6b) feeling a little hot. We rounded the evening off with The Shiner (E5 6a) and Rhubarb Champagne (E2) and wandered off to meet Stuart and Erick who were joining us. Next day, I kicked off with Read My Lips (E4 6a), again feeling a little unacclimatised to the blazing summer sun. Steve had a whale of a time on the big pitch of Ramp it Up (E3 5c) - a mega line on huge bucket jugs all the way. Afterwards, I got a chance to get on The Cuilinan (E6 6b), which again proved to be a mega trip up the wall. At first the holds were fantastic and the gear bomber. Then after a good tricky section I arrived at a wee footledge where I could cool down a bit. I slipped my boots off for a moment as my feet were cooking, arranged a spiders web of gear and proceeded waste a lot of energy trying to climb the wrong way up the headwall above. 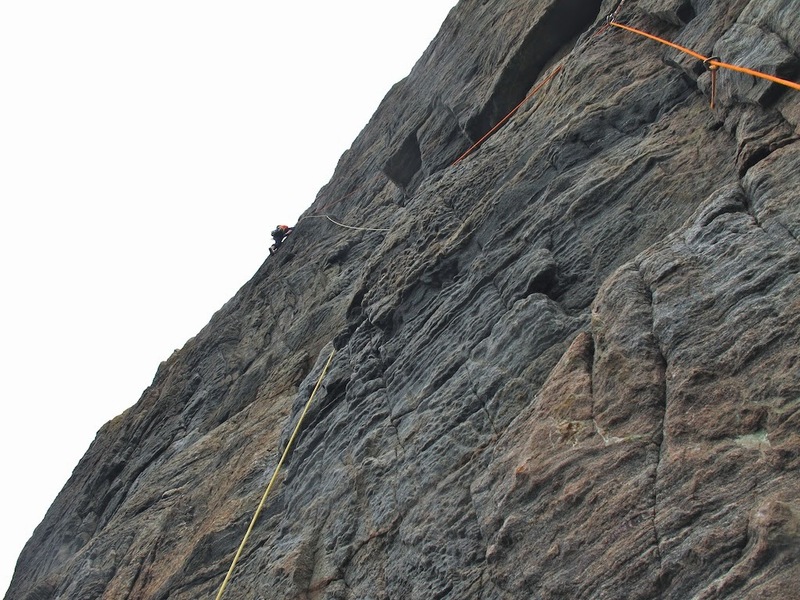 After repositioning a metre or so to the right, things went rather better and I even persuaded the in situ fulmar on the belay ledge to fly off straight away using a well crafted grunt. I think I have the knack now. 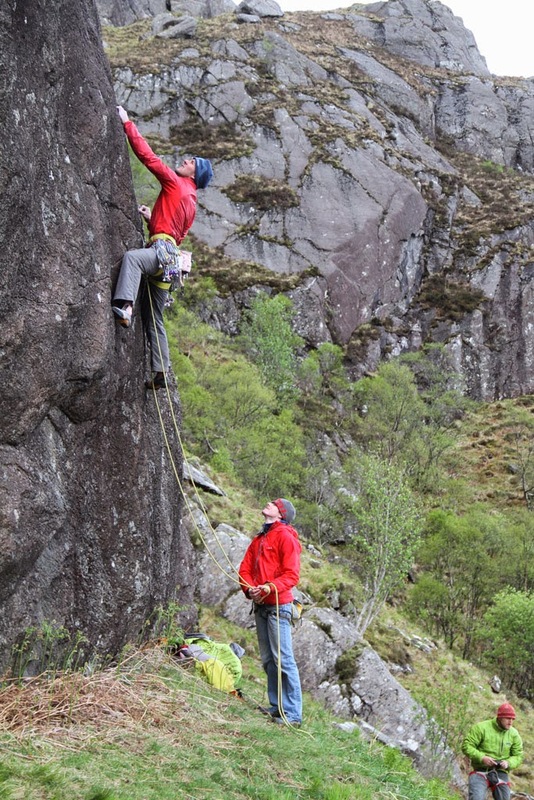 Sadly, Sunday dawned wet so we opted for active rest cruising about on some 6s and 7s at the lovely Moy sport crag. Summer is definitely here. 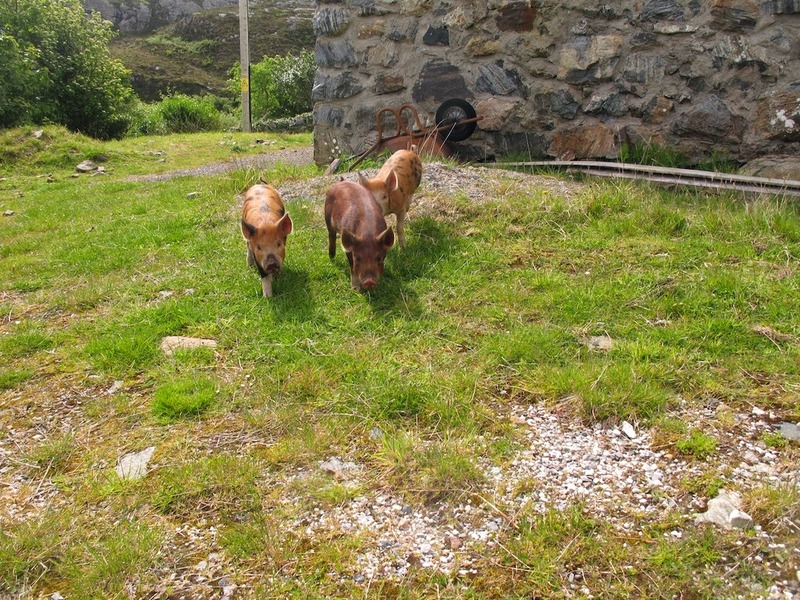 Locals around Creag Rodha Mor.